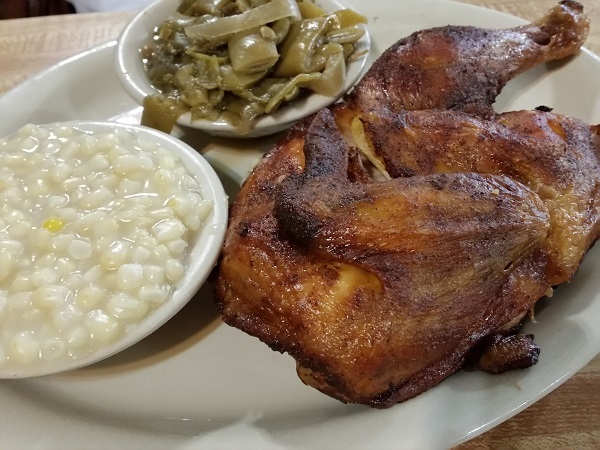 Barbecue Kitchen, College Park GA (take two) – Marie, Let's Eat! As we continue revisiting barbecue restaurants in the Atlanta area, College Park’s Barbecue Kitchen was definitely due for a second look. We first visited the Virginia Avenue business more than four years ago, and it was the third of three big meals we had in one day. Stuffed before we arrived, we didn’t get as good a feel for what the restaurant can do as we should have. So earlier this month, Marie and I had lunch here, but unfortunately we were not really thrilled with the experience. The restaurant is the last survivor of a small chain that once had at least three locations. After our first visit, I said that it looks and feels like a survivor from the late 1960s, so I was surprised to see that their sign out front now claims that it’s been family-owned since 1958. That’s older than I thought, and may place it second to Dean’s as the oldest barbecue joint in the Atlanta area. But hang on a minute, the old Gentleman’s Guide to Swine Dining (and MAN, I wish that was still being updated!!) 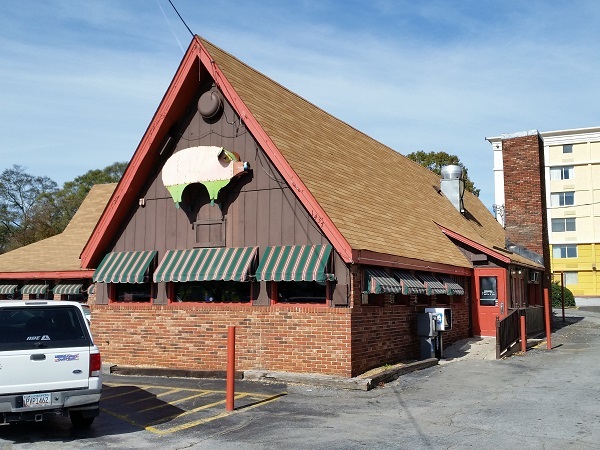 says it was 1968, and so did writer Elliot Mackle, who, in 1988, penned an article for The Atlanta Journal-Constitution to celebrate the restaurant’s 20th anniversary. I think this may be a case where we have to believe the third parties, and not the source. Parking is at a premium here, especially during the lunch rush, and we took the last free space when we arrived about 12.15. Fortunately the staff works wonders with moving people and food along quickly, because there is always a mob ordering enough plates of vegetables to fill the tables. It’s not just the locals; travelers flying through Atlanta know that if they’ve got time between flights, a quick cab ride here can get them loaded with good southern vegetables and back to the airport to move on to their next destination. 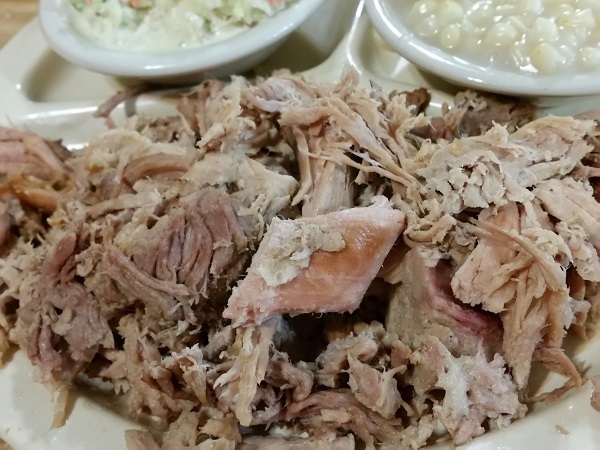 The standard barbecue pork platter runs about $10 and comes with beans, slaw, stew, and a choice of breads. But check the daily specials before you settle on that. When we visited, for just $7.85, they offered chopped pork with two sides, bread and dessert, along with a host of other options. I’m not sure what the Barbecue Kitchen was like in 1968 (or earlier), but today it’s really a meat-and-three place that offers chopped pork as one of many options. Marie decided to try the chicken, for example. We each had creamed corn and banana pudding. She had green beans and I had slaw, and while we didn’t leave unhappy, we did leave underwhelmed. The chopped pork was remarkably mild and just a little bit smoky. When I say mild, I mean it didn’t have any kind of punch or pop at all. I wouldn’t call it bland, because there was a little hint of smoke, but it was not exciting. Marie’s chicken was similarly tame, and didn’t wow us at all. Both of our meats called out for sauce. The table sauce is a thick brown Kansas City-styled one, not too sweet, and it mixes very well with both the pork and the chicken. Chopped pork here is normally served with a generous ladle of the sauce, and, sadly, I can see why. The pork and sauce together makes for a pretty good meal; without the sauce, it’s disappointing. Our second visit here for barbecue didn’t leave us all that hungry for a third. Perhaps we came on an off day, but the things we enjoyed most were the really good cole slaw and the banana puddling. If you want to revisit what Chick-fil-A’s cole slaw tasted like in the days before they packed it so full of chemicals, then you might want to try this place. It did leave us a little optimistic that a veggie plate would be really good here. Should we come by again, it will most likely be to dig into the vegetables, with the sad understanding that a nominally barbecue joint that is winning more accolades for its vegetables than its meats might have left its heyday in the distant past. Posted on November 29, 2015 August 24, 2017 by Grant G.Posted in atlanta, barbecue, georgia, roadfoodTagged atlanta, barbecue, college park / hapeville, georgia, roadfood.com.